This cake mix playdough recipe is an easy edible playdough recipe that kids will love playing with! Playdough is a huge hit in our house and it's great for toddlers and preschoolers. Follow the simple step by step instructions to learn how to make edible playdough from cake mix. Toddlers and preschoolers will love to explore with this taste safe playdough recipe! 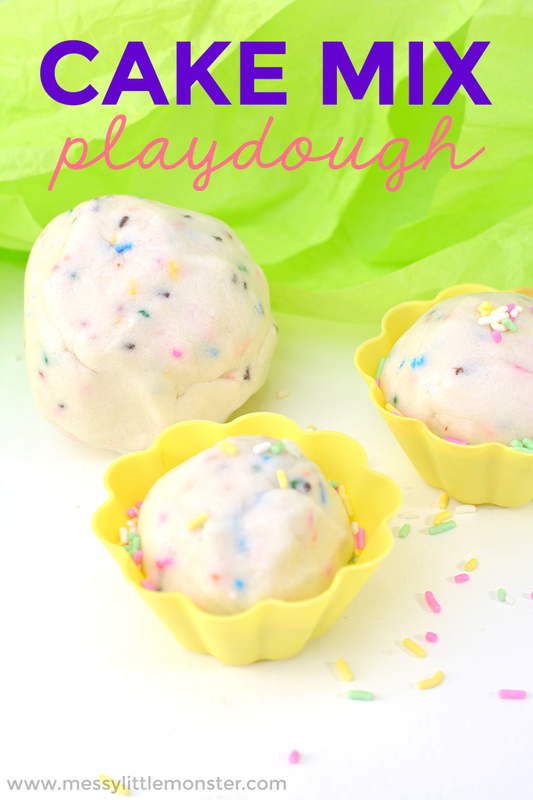 We really love having fun with different playdough recipes and this edible playdough recipe was another fun one to add to our list. 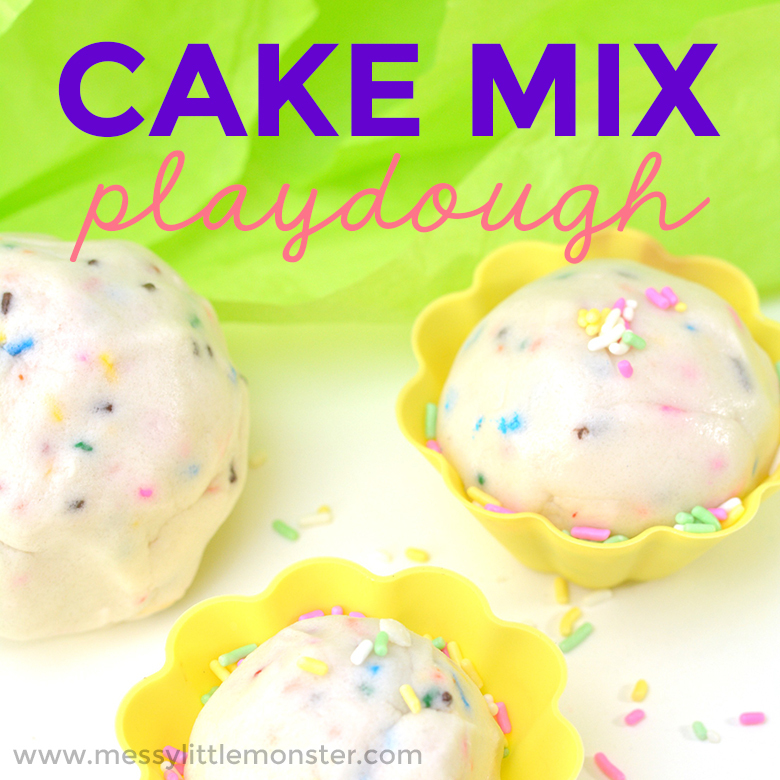 Your toddler or preschooler is going to love the idea of playing with a cake mix playdough! Add to the fun by giving the kids a few cupcake cases, some sprinkles and a few birthday candles to play with. We had fun using birthday candles when we did our cupcake counting using playdough, but it would be even more fun with a cake mix playdough. Whilst this cake mix playdough is totally taste safe, even edible, I wouldn't recommend actually encouraging your toddler to eat it! We have called it edible taste safe playdough as it is safe if your toddler or preschooler accidently put it in their mouth as all the ingredients needed for this playdough recipe are edible ingredients. 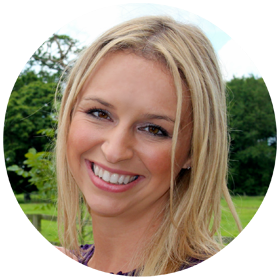 For this reason you don't need to worry if your child takes a sneaky bite like you would with shop bought playdough. 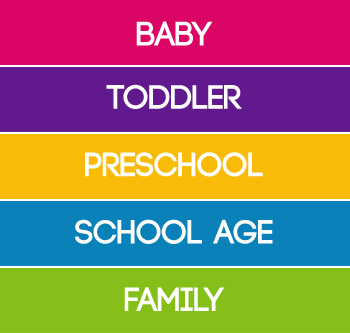 Looking for more playdough activities? We love creating small worlds with playdough like in this woodland playdough activity! Below you'll find easy step by step instructions to show you how to make edible playdough from cake mix! 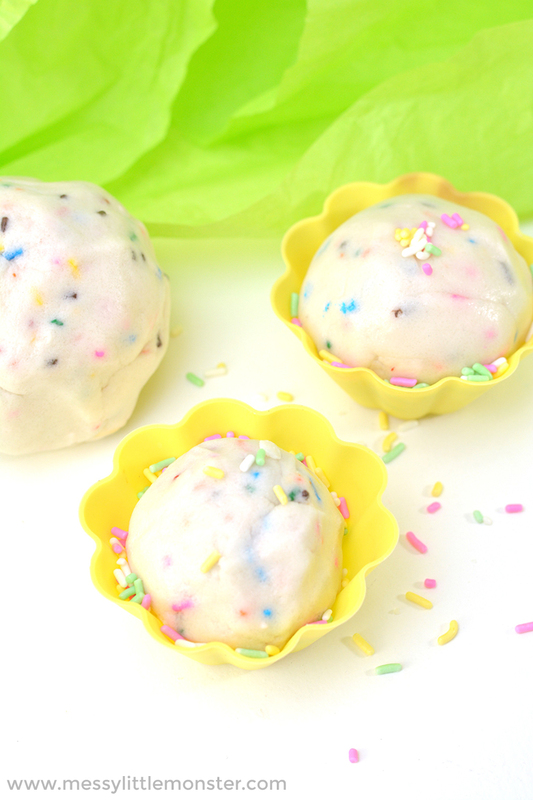 Your toddlers and preschoolers are going to love this taste safe playdough recipe. Before we get started, I like to make sure I have all my ingredients for my edible playdough recipe nearby. This makes things so much easier in the kitchen! It is tempting to make the playdough yourself in advance ready to give to your child (and a lot less messy! ), but letting toddlers and preschoolers help to make their own playdough really adds to the fun! 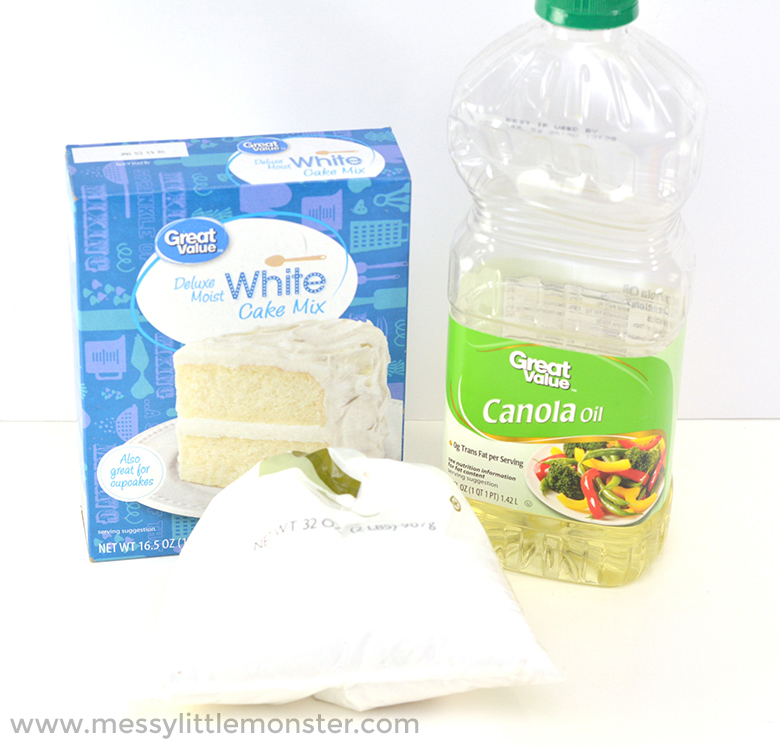 Combine the cake mix and oil in a stand mixer or a large bowl. 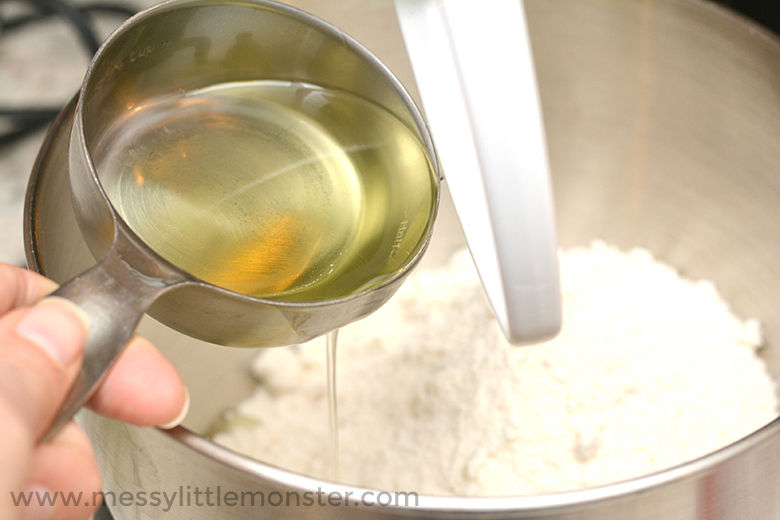 Once the cake mix and oil are mixed together, mix in the cornstarch. Once the cornstarch is mixed in, start to add in 5 tablespoons of powdered sugar. You'll want to add in a little at a time as you mix. Depending on the cake mix, you may need to add additional powdered sugar beyond the initial 5 tablespoons. 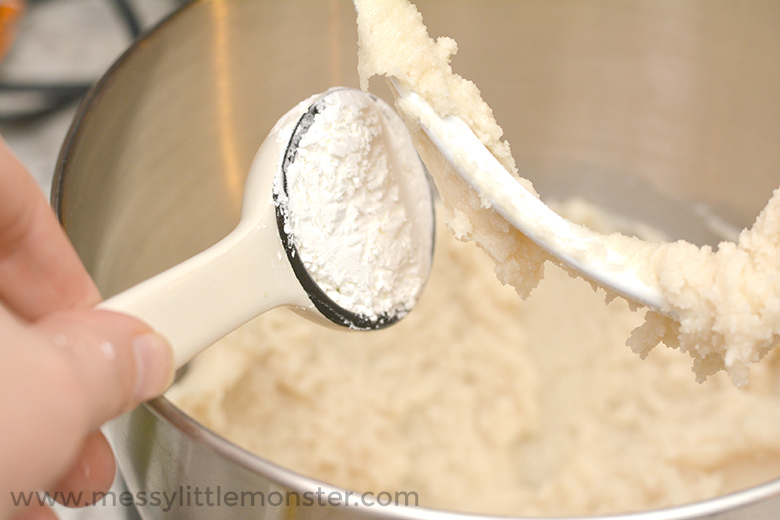 Continue to add more in 1 tablespoon increments until you reach your desired consistency. After you've reached your desired consistency, it's time to add sprinkles! This is the fun part. Add in as much as you like until you're happy with the result. If you let your toddler or preschooler add the sprinkles you are most likely to have the whole container added into the mixture! Keep a few sprinkles back if you can as they are fun to add later once the play begins. There are so many ways that you can play with your cake mix playdough. 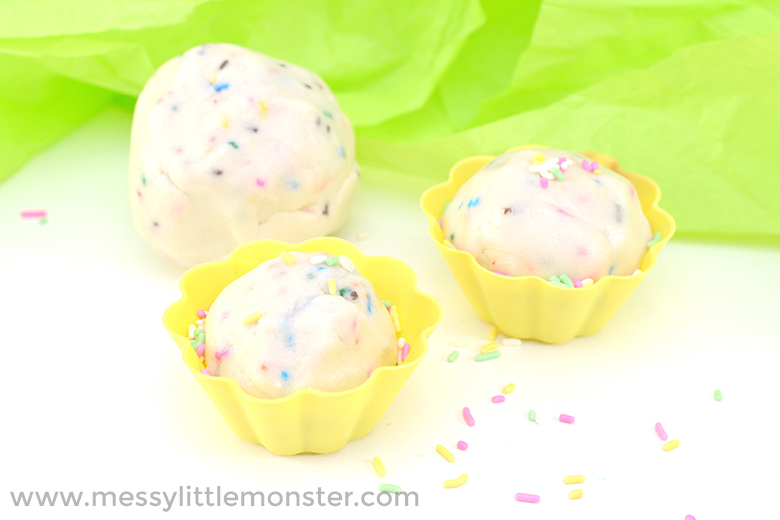 It would be fun to give your toddler or preschooler the cake mix playdough alongside sprinkles, cupcake cases, muffin tins, birthday candles etc so they can make their own bakery or cake shop. You could add some little plates and a tea set too! 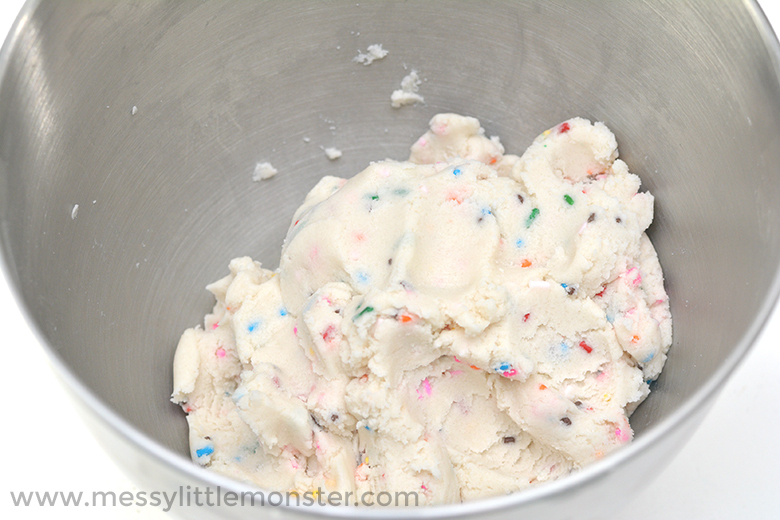 For some reason this edible playdough recipe reminds me a little of ice cream! A fun alternative to a bakery or cake shop could be to set up a fun ice cream parlour by providing ice cream cones, small containers, spoons and sprinkles! The fact that this cake mix playdough is edible means that you have the added bonus of not having to worry about small children putting the playdough into their mouths. If they take a sneaky bite it doesn't matter! I wouldn't actually encourage children to eat the playdough, it's just safe if they do! If you keep all the items you are adding to the playdough edible too the whole activity will be taste safe for young children. Your cake mix playdough can be stored in an airtight container in the fridge for up to a week before you'll need to make more. However if your child will put the playdough in their mouth I would advise discarding it after one use. If you enjoyed this taste safe playdough recipe you must try out some of our other playdough recipes and playdough activities. We hope that you have enjoyed following these easy step by step instructions to learn how to make edible playdough from cake mix. Playdough activities are always so much fun for toddlers and preschoolers!